Ghumakkar Insight –Let's wander! But be vigilant too - Ghumakkar - Inspiring travel experiences. Warm Greetings to you all! 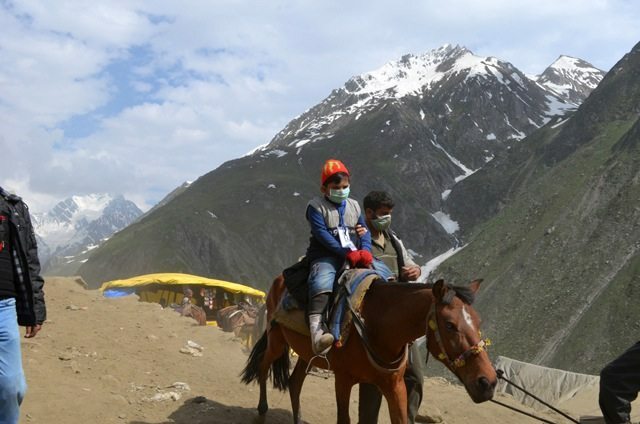 I have written my experiences on Amarnath Yatra at Ghumakkar and I believe you have read that. But in case you have missed the story you may find it here (Amarnath Yatra: A Journey of Faith). On my returning back at home from Amarnath Yatra, I wrote a letter to the Governor, Jammu & Kashimir, and then to Mr. Nandan Jha, founder of this site. I was replied by the Governor with assurances, and encouraged extremely by Mr. Jha to share the same with you all. Before I write what went wrong during the yatra, let me share with you a little piece of information. 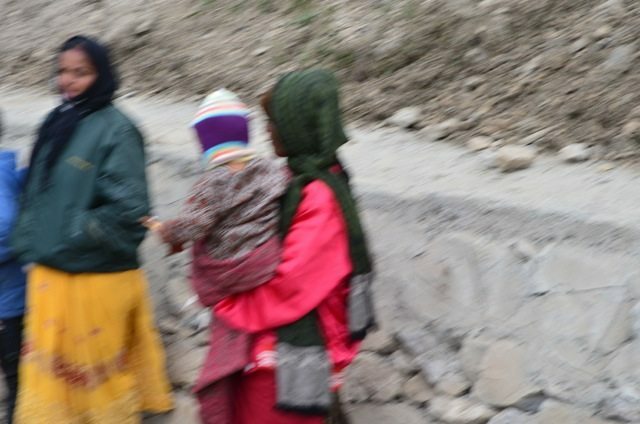 In the year 2012, expressing shock over growing number of Amarnath pilgrims’ death, which went over 100, the Supreme Court observed, “We are worried and want to ensure that no more deaths are caused.” Thereafter, a committee was set up and as per its recommendation the age criteria for pilgrimage was fixed as children not below the age of 13 years and persons not above the age of 75 years to undertake the Amarnathji Yatra. However, there were other recommendations too. 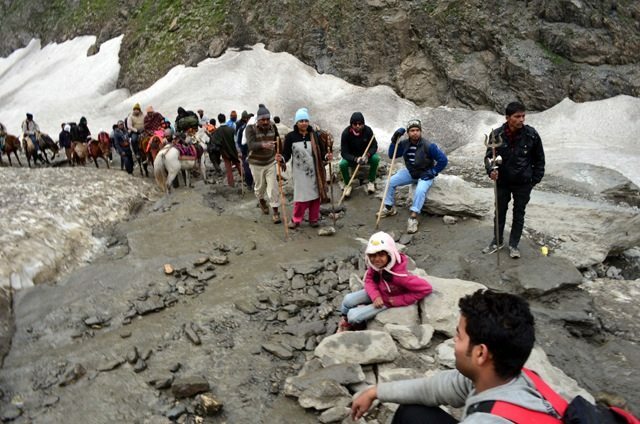 Amarnath pilgrimage ended on that year with a record death toll. How sad was that! It will be unfair on my part if I do not mention first the correspondences with Mr Nandan Jha before jumping into the facts that led to this writing. Thank you Nandan! Thank you very much for your support. 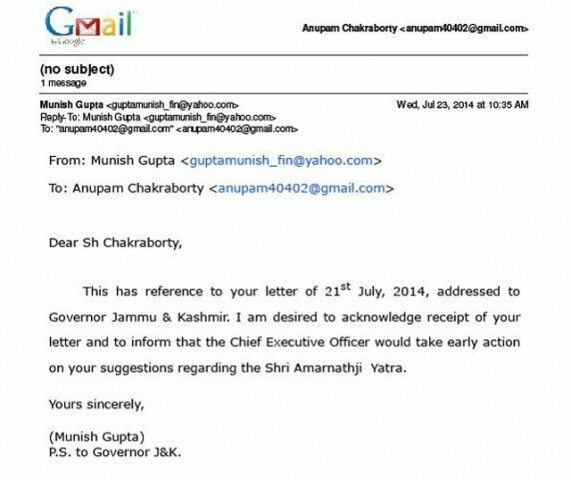 By an email dated 21.07.2014, I wrote the following observations to the Hon’ble Governor, Jammu & Kashmir. 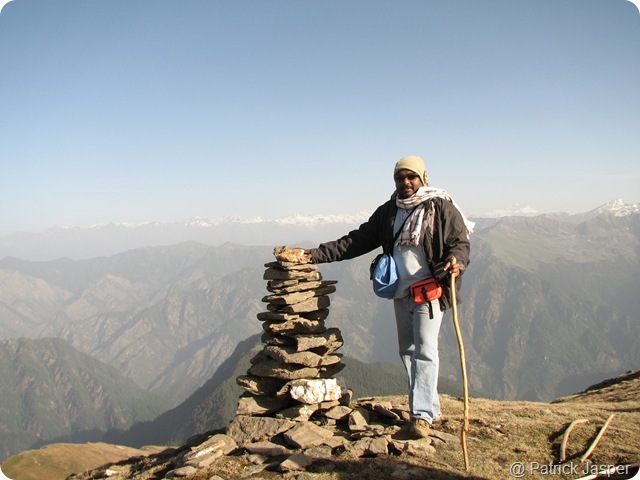 He is also the Chairman of Shri Amarnathji Shrine Board. The Kid in his mother’s lap. Age! Is he over 13 years Mr. Chairman? The above Photo was taken on the road to Sangam Top just after crossing Panjtarani. (Motion Blur was due to my movement on the horseback). Alas! The girl in the above photo would not be more than 9-10 years. Girl in the colourful costume was from Mathura. Age! 9 years only. What the girl in the above photo was doing there? Alas! She was begging. Can you imagine? At that far from her home town Mathura! I clicked the Photo near the Holy Cave. So sorry boy! Your mother might be unaware. But what your officials were doing, Mr. Chairman! The above photo was taken near the Holy Cave. Isn’t it a time to ask the parents to grow up? But my experiences as above were completely opposite and disturbing. 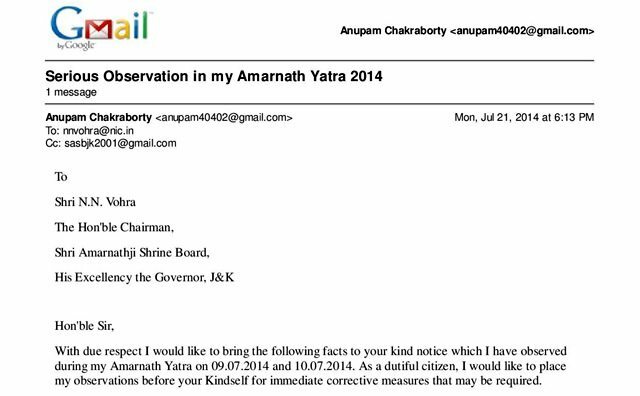 I felt it to be my duty to inform the Governor, he being the Chairman of Shri Amarnathji Shrine Board. So I wrote and received from his office the reply below. So if we only drop the ball and do not come forward demanding action for the better future and for future travellers, it is we and our generation next to suffer. If we predispose that nothing will happen and do not come forward with our feedback to the right authorities, I see then little hope for the changes. The right authorities may never know a fact if we do not give our feedback. In the present case of mine, I doubt the field officials would have reported the Governor about the above facts. So there lies the importance of feedback. I too hope like Ghumakkar Team and believe that if we keep performing as a dutiful citizen then things would really improve for a better future and for future travelers. Will you then come forward? Will you too contribute for the better future of travelling? The last thing, I believe, all of us would like to see people throwing coins or notes on Akbar’s grave. Alas! He was the richest and most powerful king of his time. He never would have imagined that people would throw coins on his tomb stone. And not also we would like to see people scribbling love messages on our historical monuments. Can’t we start protesting against these nuisances? Can’t we preserve our heritage for an Incredible India? Some words before I say bye to you. A) I love to use zoom lens for taking close up photos of my subject from distant. But when I am real close to my subject, I shoot in either Aperture priority or Shutter priority mode keeping the flash off. I may even plant my man near to the subject to get the photo. C) And I also came to know that http://pgportal.gov.in/ is a Govt of India Portal aimed at providing the citizens with a platform for redress of their grievances. One may lodge grievance at http://pgportal.gov.in/Default.aspx which will go to the Ministry/department/State Govt concerned for immediate redress. E) Last but not the least, today we are empowered with the Right To Information Act and we can assert our right to know the action taken on our feedback under that Act from the respective offices of Govt of India or the State Govt. Best wishes to you all…..
We all witness such incidences within our surroundings .Everyone can contribute rather than regretting for . 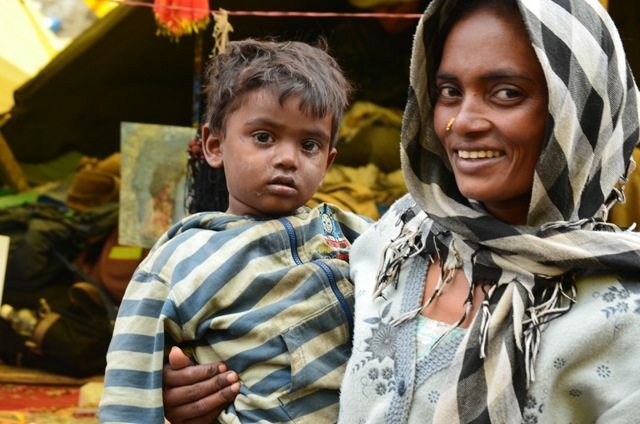 Few initial steps & couple of positive followups by authorities can change the life of thousands. Thanks Jogi. I would request you to share this story on the social media – Facebook, Twitter etc and help to spread this wide for the real change to come. It would be an eye opener for the blind bureaucrats. If every citizen fulfills his duty towards the nation this way, there is no doubt that the system will definitely be improved. Hats off to you. Thanks for awakening us…. Let us do it together. Lets us bring the change. For that I would request you to share this story on the social media – Facebook, Twitter etc and help to spread this wide. Thanks Vivek! Do that little, please share this on your facebook. Salute to you for taking the appropriate steps. We all see such things in our surroundings but become ignorant when it calls for an action. You decided to go for it, it is really praiseworthy. Thanx @Nandan too for recognizing your efforts. All such small steps for our better tomorrow, if taken by each one of us, will lead to the real change. Yes, Nandan was supportive all along with his expert guidance and views. Hope you will also come forward and will share this story on your facebook. Great effort Anupam, right from documenting the irregularities to reporting them and then spreading the word. Bravo. The links at the end of the story gives one a ready reference for whom to write, where to follow etc. With Social media, the service delivery heads (say the Chairman of Amaranth Trust in this case) are much more accessible and the ‘public opinion’ does make a big difference. I would request everyone to share this story on their social-channels (Facebook, Twitter, in their own circles of friends, family etc) and make everyone a more responsible and aware traveler. Kudos Anupam. I was alone when I wrote it to the Governor. But you have provided me the platform, your support, guidance and expert views for keeping the above before all my fellow Ghumakkars. Not only that you are also the first person to share my link of this story on the facebook. Great initiative taken by you Anupam ji. Hope this post will inspire many fellow travelers to be more aware and responsible in their future travels. Credit due to Nandan for persuading to share your experiences with fellow Ghumakkars ! Agree wholesomely with Nandan that follow up actions and campaigns like the one taken up by Anupam with the J & K Governor should be a normal occurring! Thank you so much. If this post inspire my fellow Ghumakkars I will be more than happy. Your initiative deserves great great applause!! Many of us often come across such instances but are negligent about it or perhaps do not know the right place to present the issue to. The links provided by you will be of great help to us. I must say that you have been lucky enough to have received a reply from the authorities. I think you had sent the email to the correct Point of Contact. Lastly, I would like to thank you for giving us a whole new perspective of travelling. If each of us can do the same our country will reach unthinkable heights. Thank you Sharmistha. Actually I firmly decided to take up the matter with the right authorities and yes, lucky to have the reply. But more important is that the authority has assured for taking action. You know today many options are available to us to keep our voice. Ghumakkar is one of such apart from the news channels and other social media. As you rightly said “Travel for good cause” and if we all together look differently and go ahead for that cause, I believe, we will surely contribute for better future of travelling. You amazed all of us by your vigilant pilgrimage to Amar Nath Shrine. The mushrooming growth of roadside beggars, specially the child beggars, who are compelled to involve in this dirty job and earn money for their family is really so sad. 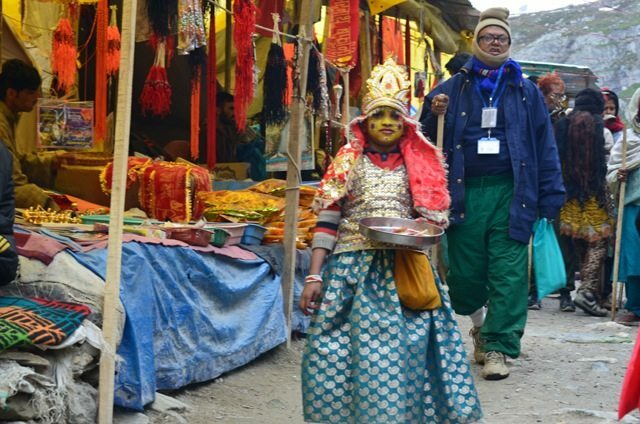 During my trekking to Mata Vaishno Devi Shrine, I have also noticed some girls (below the age of 10 years), who were being paid to get the blessings of Mata Rani. Watching a girl child in so pity condition at the temple complex of Mata Rani, which is very famous for worshiping the girls does not looks good….. of-course I was hurt. Keep traveling with your vigilant view. Thank you so much and I too invite you too be a vigilant traveller. 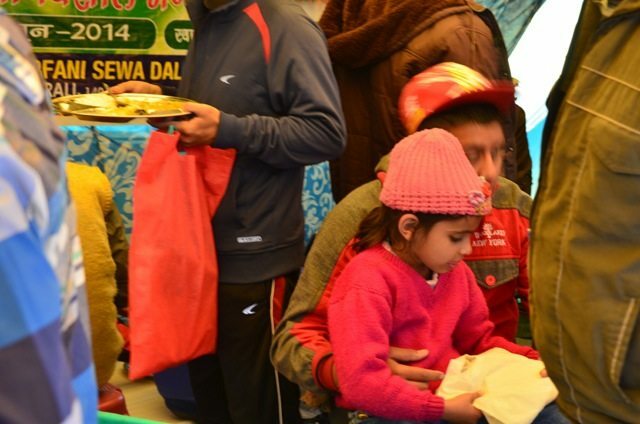 Your experience at Vaishno Devi Shrine also speaks somewhat the same story. Let us come together, let us speak out, let us start with writing to the authorities concerned when ever we come across such unpleasant situation. I hope we are responsible and capable enough to take that little step for our future travelling because we all love to travel and travelling is more enjoyable in a right atmosphere. I have witnessed all these many times but never thought of complaining to concerned. You have taken a great initiative. Salute to you. I have noticed one more thing which is common every year that few adults along with families start begging in different style. They tell pilgrims that they have come from Odisha state and have lost everything on route and ask few hundred rupees for return ticket. Interesting thing is that you will find them at same place on return journey. Yes Naresh Ji, I too experienced that on both the Pahalgam and Baltal route. And they mainly target people going on horseback. And surprisingly, I have seen people from north, south and east India doing that practice. I wonder people go for begging at such unfriendly terrain! Wonderful job you done by not keeping silent and keep grudging as people like me do. YES we all are with you in the excellent initiative. Raising voice for the truth is our right and must be heard. With some amazing information you have opened eyes of all, including mine. But, it is not all government’s duty, some civic sense is missing in us too. I noticed such crap things during my visit too & have even found Thugs in guise of pilgrims begging money with pathetic stories. People selling fake objects etc.etc. It is pretty pitiable to notice such things happen in all our religious places. Be it Mathura or Amarnath. All death are caused due to intentional ignorance. I too had mentioned such things in my t’log on Amarnath Yatra, but it is our responsibility too, to take care of ourselves and our dear ones. Not all is fair in the name of religion. Our socio-political system is governed by our customary practices and not as per law. The officials siting on the tops belong to the same society and more or less bear same mental status, all is fair in the name of religion. And our media shows what we like to see, matter of TRP. Any stern action will only lead to baseless chaos & media hype. See what is happening in Mathura on Hema Malini’s remarks. We the citizens need to enrich our mentality & behave civilized by way of action and not talks. We need to stop thinking what others want us to think, let us ponder in our own way. I never jump a red light even when there is no traffic-cop around and that is a civilised way of action. Try to follow small rules and that will become your habit. Thanks for your views. I totally echo with you that ALL IS NOT FAIR IN THE NAME OF RELIGION. I also strongly support that following small Rules becomes the habit and that is really good. I will share here with one such small incident. One day I was standing by the side of an one way small road. One Cop was also there. A signboard was kept by the side of that road showing NO ENTRY. It was a Sunday. A biker while entering into that small road was stopped by the Cop. The gentleman replied, today is Sunday :) Policeman asked him if law gets relaxed on Sunday. Awareness is what we need to spread and this a little step towards that. Hats off . HIGHLY Impressed . Thank you Pamela for taking out your time to read the post. Yes, if we take steps towards that we will contribute at least something for the betterment of our traveling world.